THIS PRODUCT CONSISTS OF A 97-PAGE PDF "E-BOOK,"
Begin Seeing The Results Tomorrow? Most radio station websites are...not very good. Many — I’ve got be honest — are awful. By “awful”, I mean they’re a waste of the company’s money. Of course, I’m not saying yours is awful. After all, I haven’t seen it. But I do feel quite confident in predicting it’s not as good as it could — and should — be. You’re a station manager or program director, not some Internet whiz kid. As a manager, you can calculate EBDIT while opening your mail. As a PD, you can break out the latest ratings trends while still half asleep. But the Internet? You haven’t had the time (or desire) to learn how to create a profitable, ratings-enhancing website. So you’ve assigned that task to someone else. On The Other Hand, It Is Your Fault, Partly. If you’re the manager or PD, your station’s website is your responsibility. And that “someone else” who is handling your website needs your help. That’s why 76 WAYS TO IMPROVE YOUR RADIO STATION WEBSITE is written in everyday English. No tech talk, I promise. A few of the secrets, tips, and techniques do require your webmaster to do something technical. But in those cases, I explain it to you in simple English and tell you exactly what to say to your webmaster to achieve the desired effect. You manage or program a radio station. If you’re the station manager, read 76 WAYS TO IMPROVE YOUR RADIO STATION WEBSITE and then have your PD read it. If you’re the PD, read 76 WAYS TO IMPROVE YOUR RADIO STATION WEBSITE and then either give it to your manager to read or — if you truly want to “fast track” your site’s dramatic improvement — prepare a 15-minute presentation for your manager, making recommendations based upon what you’ve learned. At first, your webmaster will be shocked that you’re taking such an active, informed interest. And then your webmaster will be thrilled: At last, you’ll have given him some smart, easy-to-implement guidelines to help make your site an extremely valuable part of your operation. Don’t download this book if you’re looking for lots of technical jargon. A successful station website is a marketing tool. That’s how I’ll discuss your site in this book. Don’t download this book if you’re looking for a rehash of tired ideas you’ve seen elsewhere. 76 WAYS TO IMPROVE YOUR RADIO STATION WEBSITE combines the latest, state-of-the-art research on Web usage with my own expertise in communicating to radio’s “customers (i.e., listeners and advertisers). Don’t download this book if you’re not already familiar with my expertise in radio programming and/or radio advertising. If I haven’t already proven myself to you in some other book, seminar or consulting environment, why would you put your faith in my 76 recommendations for your station website? 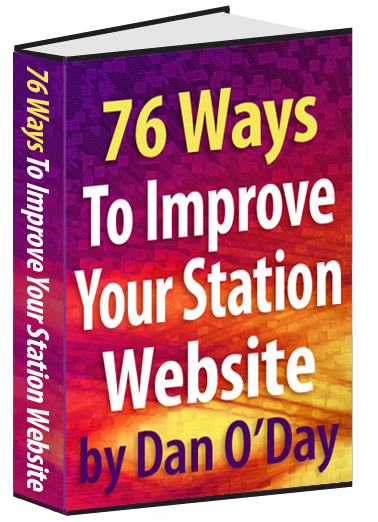 Click the button below to add the 76 WAYS TO IMPROVE YOUR RADIO STATION WEBSITE IMMEDIATELY Dan O’Day (e-book) to your wish list.